The people are onto Maggi’s whereabouts. She thought it would be hard to locate, but our sharp Stu News readers have spotted this unique weathervane. Or maybe the architecture was a giveaway. Either way, these folks got it right: Kathy Bienvenu, Pat Carpenter, Meg Monahan, Kara Kruse, and Howard Conn.
Bobby and Sherman are currently taking the title of Pets of the Week. These two are seven-year-old brothers who are neutered doxie mixes. They are very sweet and well behaved. In addition, they are also housebroken. Bobby and Sherman have been at the shelter for a while, and are eagerly hoping to go home with a new family. They are full of love and will warm up to you right away. Nancy Goodwin, shelter director, hopes to see both Bobby and Sherman adopted as soon as possible. The Laguna Beach Animal Shelter adoption procedures are designed to make sure that both the potential family and the animal adopted are in the very best situation possible. Due to their approach to adoption, the shelter’s return rate is five percent as compared to the national return rate of 50 percent. The LB Animal Shelter is located at 20612 Laguna Canyon Rd. For information on adoption procedures, call (949) 497-3552 or go to www.puplagunabeach.org/our-pets.php. Toning down the passion of red with the purity of white results in the softer pinks that are associated with romance and the blush of young lovers’ cheeks. It’s not surprising that when giving or receiving flowers, pink blossoms are a favorite. 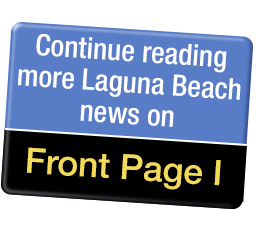 Laguna Beach’s own Laguna Beach Pride 365 organization has become a nonprofit California corporation and will soon be recognized on the federal level with its 501(c)(3) application in process. With that the organization will have a new Board of Directors. Craig Cooley, yes moi, will serve as President, Jonathan Colliflower as Vice President, Michelle Volz as Treasurer, and Harry Huggins as Secretary. There remain two BOD vacancies to be filled. If you might be interested, let us know and attend one of our meetings to find out what it is all about and how rewarding volunteering can be! The most recent contribution was the entire BOD’s volunteering to assist a very successful community organization, G4G, that is “Gay for Good’s,” 10th year anniversary celebration this last Sunday in Los Angeles at the LA River Center and Gardens. This Friday, April 12 at 6 p.m., at Nirvana Grille, Laguna Beach Pride will host its own Silent Auction fundraiser. Local community businesss have generously donated more than $5,000 in auction items, from hotel stays to yoga training sessions. Restaurants top the list: Watermarc, Skyloft, Mozambique, and Dizz’s, to name a few. It is a great opportunity to bid on an item and win it, often at half or less of the retail cost! And to also support the diverse community we all enjoy. The silent auction benefits the annual Pride Festival that is just a few short weeks away. If you can’t make it to the Silent Auction at Nirvana and you would like to support the organization, just link to Laguna Beach Pride 365 at www.lagunabeachpride.org/corporate-sponsor. More about the Pride Festival weekend: Planned is a full host of events for three days, May 31 - June 2. This year it is more about activities like hiking in the canyon. The venue, Seven 7 Seven (formerly Tivoli Too), is located in the Canyon at, appropriately, 777 Laguna Canyon Rd. There will be more than 20 informative organizations represented at the event. From the local Gay Realtors Association to the local Laguna Beach Police Department, from yoga demonstrations to health and wellness booths, from social groups to community assistance programs…just about everything will be represented! There is some great entertainment scheduled too – from new artists to popular dance DJs. To see a full celebrity schedule and list of events and activities, go to www.lagunabeachpride.org/festival-2019. Here, a first…in Laguna Beach! The big news in the LGBTQ community is that there is a gay Presidential candidate, Pete Buttigieg. I know, hard to pronounce (try Pete BOOT EDGE EDGE). But for all of us here in Laguna Beach, that is nothing new, as our very own Fred Karger officially ran for President in 2012. Yes! We have many firsts here in Laguna Beach. So, I have started a one-man campaign, by myself, and that is to get Pete to visit us here in Laguna Beach. And if he can’t do that, then maybe he can call in on my weekly Rainbow Radio program for 20 minutes or so. I would love to have Fred Karger in the studio with Pete on the phone. We could ask all the “Barbara Walters” kind of questions – the ones everyone needs to know – well, professional presidential questions that is. He is a serious contender and has placed third behind Joe Biden and Bernie Sanders in fundraising and is positioned to be included the preliminary presidential debates. He was indeed on Meet the Press this last week. Check it out, he makes excellent sense. So, I have sent a message to Pete’s offices and asked if he could spare 20 minutes for the radio program, or even the Laguna Beach Pride event the first of June. If you are so inclined, help me out, maybe a GoFundMe for travel expenses to entice Pete to our fair beach city! Now that would be very cool. So, there you have it for this week – lots of going on here in our beautiful beach city – lots to be prideful of. Until next week…Craig Cooley here doing my best to keep up with all the LGBTQ fun in Laguna Beach. Richard Gardner was diagnosed with Multiple Sclerosis (MS) 18 years ago at the age of 41. He also has lived with diabetes since he was 14. His right leg has no movement now, so he uses a walker or most of the time, a wheelchair. Gardner has always been an active person that loved to surf, ski, and swim. Luckily, he has upper body strength and can still swim. It is where he feels free and normal. His legs are not a hindrance when he is swimming in the pool or a lake. His life’s mission is to raise awareness about MS and its challenges; he started the “When I Swim Foundation.” His goal is to swim the Lakes of the Sierra Nevada. He has swum the lengths of Shaver Lake, Huntington Lake, and this summer, he will be swimming Bass Lake. The money he raises is given to USC Care Center and Research. His swims are challenging and require a team of friends and family that kayak alongside him in case of trouble. The swims can be as long as two hours in frigid water. Fortunately for Gardner, a fraternity brother from USC, Kevin Griffith, saw the post. He immediately sprang into action and reached out to his Sigma Chi brothers and proposed they pitch in to buy Gardner a board. Within two days, he had 20 plus fraternity brothers willing to help. Not knowing anything about adaptive boards, Griffith called his friend, legendary pro surfer and Laguna Beach resident Ian Cairns. Cairns immediately hooked him up with his shaper, Dave Daum. It turns out Daum, and his wife Rhonda, own King’s Paddle Sports in Carlsbad. A plan was formulated. Rhonda called Gardner and told him an anonymous person was buying a custom board for him, and asked him if he could come down to the shop so they could discuss his needs and abilities. Gardner contemplated the mysterious donor for months. Who could it be? Much to his surprise and amazement, his fraternity brothers were all gathered and cheered him on as he entered the restaurant. Many of these friends had not seen each other in 30 years. Not only was there the custom belly board with the Sigma Chi crest on the front, but also a custom display board that is a vintage shape from 1977 that Dave had originally made for Cairns. Artist and former Navy Seal Pete Carolan custom airbrushed the board to resemble Hawaiian koa wood. All donors signed the board. To read more about Richard Gardner and his foundation, visit www.wheniswim.com. Enjoy yourself while trying out a new outdoor fitness class this month. The City of Laguna Beach Community Services has many spring classes to choose from to stay active and involved in the community. Pickleball 101 will cover the basics of pickleball rules, terminology, primary skills, coordination, and more all at the beautiful Alta Laguna Park. Taught by experienced instructor Hai Nguyen and staff, this class is designed for beginners in the pickleball game. Classes will be held on Thursdays starting on April 18. Cardio Fitness is designed to improve students’ fitness levels in an energizing cardio workout while benefiting from drill practice. Players will consistently elevate their heart rates in their aerobic training zone. Classes are held on Mondays at Laguna Beach High School from 7:30 - 8:30 p.m. The Outdoor Yoga and Meditation class will be held on Fridays from 9:30 - 10:30 a.m. at Alta Laguna Park. Students will enjoy forty minutes of contemplative yoga followed by twenty minutes of guided meditation amidst the breathtaking scenery of Laguna’s hillsides. All levels are welcome. For more information on these classes and to register, click here.